DANGER TO AMERICA in SUEZ Crisis! FANTASTIC push-button world by 1975? It is being planned by modern science and industry. But now you're going to take a peek into the surprising future, exactly as it will happen! Not what men PLAN—but what GOD SAYS! Here, in understandable language, is a quick SUMMARY of all prophecy—the neglected one-third of your Bible—made PLAIN. It's truly startling! YOUR own future is laid bare, now, in prophecy! The curtain of the future is drawn back. Prophecies that were closed and sealed tight now stand REVEALED. This mystifying, neglected third of the Bible now becomes plain. Mysteries of God, never before understood, now become crystal-clear. God's own time for this revealing has come. The KEYS that locked the future have been found. But what is actually going to happen is not what the world expects! Today this world is changing—fast! Unprecedented events are shaking the world already. Yet what we have seen is mild compared to the catastrophic happenings that will rock this world in the near future! You'll have to live into these tremendous times. This is YOUR life! You live here, in this erupting world! It behooves you to know what the Creator-RULER of the Universe now makes known! First, take a quick look at the world MAN envisions! Feverishly, science, technology and industry are working to produce a fantastic, push-button world of leisure by 1975. The emphasis today is on "saving steps." Everything is to be done for us, by machines. Just push the magic button, and your work will be done automatically. Already automobiles are equipped with push-buttons to shift the gears, raise or lower windows, move the seat forward, backward, up or down. In the dream-world MAN is devising for tomorrow, it will no longer be necessary to cook food on stoves. Food is to be cooked by heat waves in packages. You'll no longer bother taking a bath in a tub or shower. You'll take an effortless and quicker waterless bath by using supersonic waves! When you pick up your telephone, you'll see the party at the other end! The new automobiles, the new homes, the new schools are to be truly fantastic. The stores, hotels, and railroad trains will take your breath! And air travel? Well, already leading air lines have placed multi-million dollar orders for still larger jet planes that will leave New York at 11 in the morning and arrive at Los Angeles by noon. These are under production, now. But what do you suppose air travel will be like by 1975? For one thing, it is expected that many people will commute in their own private helicopters. Very probably these immense jets now being built will then be obsolete, and we'll travel in rockets at two or three thousand miles per hour. Think of it! Elapsed flying-time, New York to Los Angeles reduced to one hour! Since it is only 9 A.M. in Los Angeles when it's noon in New York, we may be flying across the continent, and arriving in Los Angeles two hours before we start! And elapsed flying-time from London to New York will be reduced to 1 1/2 hours! As it is noon in London when it's only 7 A.M. in New York, we may be flying across the Atlantic and arriving in New York 3 1/2 hours before we start! Yes, MAN is devising fantastic things! Yet even our optimistic human forecasters see a few alarming portents in this march of supposed "progress." The magazine Changing Times, in an article on the push-button world of tomorrow, says: "Leisure time will be abundant. The problem will be what to do with it." And that's the kind of problem that leads to broken homes, immorality, crime, universal violence! The October, 1955, "Coronet," forcasting the world of only ten years ahead, added that one child in ten will spend time in a mental institution! While this magazine said "the sun will heat your house; a jet engine will power your two cars, and atomic radiation will preserve food in a kitchen that disappears," it also forecasted: "Juvenile delinquency and marital infidelity will increase, and one in every three marriages will end in divorce." But don't misunderstand! No question about it—these fantastic devices actually are on the way. We'll probably have most of them! But is that GOOD? Will people know how rightly to use this leisure time? Actually this very man-devised "blessing" will become man's fatal CURSE! The preachers picture a "heaven" of idleness and ease. This state of things is the phantom "utopia" of man's dreams. Science and industry now strive to produce it on earth without God! But what they are producing is a western world of soft degenerates, immoral, irresponsible, sick of mind and diseased of body, while at the same time the forces of government and science combine to produce engines of destruction that can blast human life from off this planet! We are entering also the era of push-button warfare! The fateful race between Russia and the U.S.A. for producing guided missiles with hydrogen-bomb warheads is now on the home-stretch! Just how far will God Almighty permit this hellish trend to drift? WHAT IS REALLY GOING TO HAPPEN? First, before we begin the SUMMARY of ALL PROPHECY, hear the GOOD NEWS! I'm going to do the unconventional thing, and even before I tell you the story, reveal to you how it all comes out! I don't think, in this instance, it will spoil the story to hear it's ending first. In the end, we are really going to have world peace! We are going to have actual UTOPIA—far beyond the dreams of today's world-planners! It will not be a millennium of man's devising, however. It will not be a world of idleness and ease—but one of production, plenty, health and happiness. This scene of utter destruction—depicting the grim, lifeless result of misused human inventions—would take place in this generation but for God's promised intervention to save man from this terrifying end. MAN does not know the WAY to peace and happiness and joy. What man is bringing on the world is the diametric opposite—such catastrophic and terrifying destruction that human life will be erased from the earth in 25 years unless God Almighty intervenes! But the Creator and Director of all force and energy is going to intervene! Mankind has some monumental lessons to learn. So far, mankind has merely written these lessons in human experience, while he has refused to learn them. But God Almighty is working out His PURPOSE here below! We are entering the very CRISIS at the CLOSE of the allotted 6000-year period for working out that purpose. Now, in short order, in constantly accelerating swiftness, events will speed up, and mankind is going to be FORCED, by the supernatural power of God, to learn the supreme lesson of the ages—that God's laws and ways were set in motion for our good, and that the Eternal is RULER over all! Yes, the supreme crisis of the ages is upon us. Today we're in the cold-war lull before the real storm breaks in imagination-defying fury. Then, suddenly, God will step in and take over! He will speedily punish this world for its iniquity! The divine WRATH will quickly subdue a defiant world that has reached the end of its rope! Supernatural intervention will prevent humankind from committing suicide. God will send Jesus Christ once again, in person, to earth in all the supreme POWER and GLORY of the RULER OF THE UNIVERSE! And the misguided humans of earth will be ushered into an unbelievable UTOPIA of GOD'S making—and delivered, at last, from their own folly! But where are we, NOW, in the panorama of prophecy-fulfillment? And what's the very next thing to happen? Are we now being sucked into the vortex of a hydrogen-bomb war with Russia? That's the inevitable first question. The answer is that no such war is included in the many prophecies that fill a third of your Bible. It hardly seems possible that the hundreds of detailed prophecies would omit all mention of such a war, if it were going to occur. Actually, in a different sense, Russia started World War III, Russian-Style, immediately after World War II. But that war is a psychological warfare of propaganda, infiltration, subversion, demoralization. It is a warfare that has attacked our minds, our moral and spiritual values, rather than our bodies and our earthly possessions. Almost no one has realized it, but that war is described in the prophecies! What we fail to grasp, in the struggle with Russia, is this: We are not fighting a single nation in a military war, but a gigantic world-wide plain-clothes army, masquerading as a political party, seeking to conquer the world with an entirely new kind of warfare! It's a kind of warfare we don't understand, or know how to cope with. It uses every diabolical means to weaken us from within, sapping our strength, perverting our morals, sabotaging our educational system, wrecking our social structure, destroying our spiritual and religious life, weakening our industrial and economic power, demoralizing our armed forces, and finally, after such infiltration, overthrowing our government by force and violence! All this cleverly disguised as a harmless political party! COMMUNISM is world-wide psychological WARFARE! Yes, but God Almighty says of this satanic system: "I am against thee!" (Ezekiel 38:3). Eventually, He will destroy it and its evil system from the face of the earth. But of us, prophecy says that we allow ourselves "to be mixed up with foreigners: ... foreigners eat away his strength, unknown to him." God says we fly, like a silly, senseless dove, to seek alliances with foreign nations, forsaking God. (Hosea 7:8-13, Moffatt translation). But the prophecy reveals no military war between Russia and our democratic nations. The prophecy of Ezekiel 38 describes a much later event. Meanwhile, however, Russia is exerting a tremendous influence over trends in Europe. All Europe is directly under the shadow of the Russian Bear. Suppose that your nearest border were the dread "Iron Curtain" with the millions of Russian troops massed just across that line. You would be thrown into a state of fear. Most Europeans are becoming distrustful of the United States. They wonder why we had the Marshall Plan. WHY are we so beneficent? WHY are we sending them so much money? They can't understand altruism and generosity. They suspect ulterior motives. They are thinking more and more about the coming UNITED STATES OF EUROPE! We Americans, with the British, gave them the idea. We've tried to organize the European nations together against Russia. They are going to unite against us! And now Europe is about ready for it! The stage is all set! All that's lacking now is the strong LEADER—the coming FUEHRER! The Germans are coming back from the destruction of World War II in breath-taking manner. Germany is the economic and military heart of Europe. Probably Germany will lead and dominate the coming United States of Europe. But Britain will be no part of it! This astounding resurrection of the ROMAN EMPIRE is the very NEXT prophesied event. The world will be dumbfounded when this military colossus actually emerges. While America has been focusing its sole attention on its clumsy effort to meet psychological cold war with antiquated diplomacy and military might, the real number one enemy has been perfecting its plans SECRETLY, UNDER COVER, IN EUROPE! These plans were laid by Adolph Hitler, during World War II. The methodical Germans took into consideration the possibility they might lose, even as they had lost World War I. This time their plans for coming back and launching World War III were carefully laid before the close of World War II. The day that war ended, the Nazi organization went underground! Their plans for coming back have been proceeding, under cover, since 1945! Already Nazis are in many key positions—in German industry—in German education—in the new German ARMY! The new Germany REBUILDS! These two sample bridge supports were built in downtown Dusseldorf, Germany, to allow city planners time to decide which type of construction was most desirable for the Rhine River bridge. Notice MODERN apartment building-a common sight in the NEW Germany. In World War I, the Kaiser, allied with Austria, sought to conquer France, Britain and America. American Industry finally beat him. In World War II, Hitler tried to conquer the world, first by taking Austria and the Sudetenland thru diplomatic gangsterism; then second, with lightning-quick war, taking Poland, Denmark and Norway, Holland, Belgium and France; and third, while holding these nations by the throat with his Gestapo, and allied with his junior partner Mussolini, to conquer Russia on the east and Britain on the west. But again, American industry, and three Acts of God, at Dunkirk, El Alamein, and the destruction of the German hydrogen-bomb plant at Peenemuende defeated Hitler. But this time the Nazis plan to sidestep the causes of past defeats. Instead of exhausting their own strength by holding European nations as captives at the expense of vital Gestapo man-power, they plan to head and dominate a UNITED STATES OF EUROPE—and add the man-power of those nations to their own military divisions. And secondly, they plan to strike their first blow, NOT at France or Poland in Europe, but with hydrogen bombs by surprise attack on the centers of AMERICAN INDUSTRY! Here is an example of German industrial ingenuity. This new track-laying machine being used between Neustadt-Holstein and Bad Schwarten, Germany, can lay 820 yards of railway track in about eight hours! The device also deposits the rails on the heavy ties after they have been laid. You think all this fantastic? Well, LISTEN, and LISTEN CAREFULLY! Because these very Nazi plans which have leaked out from underground and have been published were known to God Almighty and recorded by Him in His prophecies 2,500 years ago! You'll find this prophesied in Daniel 2 and 7, and more specifically in the 17th chapter of Revelation,- a UNITED STATES OF Europe—a flash in-the-pan resurrection of the ancient ROMAN EMPIRE! It will possess greater military might by far than the Rome of old, but it will also inherit fatal weaknesses. Prophecy symbolizes this admixture of never equalled military might and unprecedented weakness with the apt phrase, "iron mixed with miry clay." The European nations will unite militarily—but they are suspicious and envious of each other—they hate one another. This time the Germans are coming back from defeat faster and more effectively than they did after World War I. The comeback they are making is phenomenal—faster than any other European nation—faster than we think! While Americans bask lazily in the stultifying sunshine of prosperity, our hearts set on push-buttons, shorter hours, less work, more leisure, vacations and travel, I have seen the swarms of Germans walking briskly, brief-cases in hand, to their day's work between 5:30 and 6:30 in the mornings, down the streets of Frankfurt, Duesseldorf and Essen. While our prime objective seems to be idleness, ease and luxury, the German mind and heart and interest appears set on just one thing—hard, energetic WORK that will yet put "Deutschland Ueber Alles! "—"Germany Over All!" Incidentally, I am writing these words on a German-made typewriter—because it is a better and sounder-made machine than any American portable. The American way seems to be not how GOOD, but how cheaply and quickly can we slap things together, and how MUCH can we GET for it? If American industrial strength beat the Germans twice, present German hard work and INDUSTRY is assuredly going to beat us—unless we WAKE UP to what's actually happening, which we won't. And again incidentally, I wonder if you realize that the Nazis were working on the Hydrogen Bomb before the end of World War II? They had it very near completion. We didn't know then that it was the hydrogen bomb, but we did know the Germans were on the verge of completing some terrifying new weapon which, if perfected in time, could have turned apparent defeat at the 11th hour into unbelievable victory for the Nazis. During the latter months of the war, the central theme of my American broadcasts was that "RACE AGAINST TIME." It was only a chance lucky hit (or was it Providential?) by an American bomber that destroyed this hydrogen development, and enabled the allies to win. German nuclear scientists are the world's pioneers in this field. When this United States of Europe emerges, they will have the hydrogen bomb, and the guided missiles to project it with pin-point accuracy on every vital American and British production center! Today the stage is all set! At a certain moment, the new LEADER of this European combine will appear suddenly in the public eye. He's already behind the scenes—in action! But the world does not yet recognize him! He still works under cover. Perhaps even this coming military political leader does not yet know how many, or precisely which European nations will join in this United Nazi Fascist Europe. But you and I can know the number—for God Almighty wrote it down for us 1900 years ago, in Revelation 17! There will be ten Dictatorships, exerting iron rule over ten European nations. These TEN will give all their military power to the central over-all LEADER—pictured under the prophetic symbol, "The BEAST." Members of the German Steel Helmet (Stahlhelm) organization of veterans and pro-military youths meet in West Berlin amidst German flags and colorful military emblems. The prophecy does not reveal exactly which ten nations will be included—but this resurrected Roman Empire will bind together some 250 to 300 millions of peoples! That is more man-power than Russia, or the United States has. The strong indication of these prophecies, then, is that some of the Balkan nations are going to tear away from behind the iron Curtain. Russia has lost already, to all appearances, Tito's Yugoslavia. Russia probably will lose still more of her Eastern European satellites. But Communism, prophecy indicates, will continue to make gains in the East—probably in Indo-China, Malaya, Japan, India. For more than 22 years I have been telling the radio audiences that Communism will engulf and control the manpower of the yellow races by the time of the swift-approaching crisis of world upheaval. Also, I have warned the radio audiences to watch TITO. Of course, Tito is not identified personally in prophecy—nor is any other man. Only the major EVENTS are revealed. But I have pointed out that the difference between Nazism and Communism is simply that one is national socialism the other international socialism. The term "Nazi" is merely a contraction of the two words "national socialism." On the other hand what the Communists have set up is called the "UNION of Soviet Socialist Republics." The Kremlin fosters international socialism, while Tito stands for NATIONAL socialism. That just about makes Tito a NAZI! I have even suggested the possibility that Tito might be the man to lead the new Nazi-Fascist Europe—though that possibility has appeared most slight. Remember again, prophecy does not identify the MAN. More probably he will be a German. We shall not have to wait much longer to know! IT'S LATER THAN YOU THINK! While this coming Nazi-Fascist Colossus is developing underground, an alarming revolution is beginning to occur in the weather. Hurricanes, floods, sectional droughts are fast increasing. And now, the very next prophesied event—to strike in the full fury of its climax before our democratic nations are invaded by the resurrected Roman Empire—is a tremendous universal FAMINE over America, Britain, and northwestern Europe caused by unprecedented drought and floods. And immediately in its wake will come the most frightful epidemic of diseases ever to attack our peoples! Jesus Christ foretold it in His great Olivet prophesy: "For," He said, "nation shall rise against nation, and kingdom against kingdom"—that's WORLD WAR!—and we are now in the recess between the 2nd and 3rd rounds of it—"Then there shall be famines,"—that's the next major world event now prophesied, "and pestilences"—disease epidemics, "and earthquakes in different places." (Matt. 24:7). Already there is a violent increase in frequency of earthquakes, all over the world. While modern science and industry strive to prepare for us a push-button leisure-luxury-world by 1975, United States Assistant Weather Chief I. R. Tannahill warns us unofficially to really fear "the big drought of 1975." But the indications of prophecy are that this drought will be even more devastating than he foresees, and that it will strike sooner than probably between 1965 and 1972! This will be the very beginning, as Jesus said, of the Great Tribulation! The farmer (left, above) contemplates wind-swept dust piled in dunes on his farm in southern Kansas. Farm equipment, visible in background, has been nearly buried. Fierce winds are tearing millions of tons of fertile topsoil from America's farming areas. Buildings washed from their foundations, swept into others as impact of flood waters crashes against the town. Floods and droughts combine to ravish the land. Stricken cattle already search with bewildered, hungry eyes for non-existent food as the prophesied terrible drought continues to spread in America and Australia. Thirsty and starving cattle, unable to find forage, will finally drop of exhaustion and die on the parched, drought-stricken ground. trouble to come on America, the British nations, and the democracies of northwestern Europe! And, as both Jeremiah and Jesus Christ were inspired to record—and also the prophet Daniel—it will be the MOST CATASTROPHIC time of national trouble that has ever struck any nation, or ever will! Still more specific is the prophecy of Ezekiel. Here is exactly how catastrophic it will be: ONE THIRD OF OUR ENTIRE POPULATIONS will DIE in this famine and disease epidemic! Read it, in Ezekiel 5:12: "A third part of thee shall die with the pestilence, and with the famine shall they be consumed in the midst of thee." At the outset of this article I stated that the KEYS that had kept prophetic doors locked and closed from human understanding have now been found—or, more properly, been given to us by GOD. The Church denominations do not possess these keys, for they will not receive correction from the Word of God, nor acknowledge error, nor receive new light. What they did not possess and proclaim 50 or 100 years ago, they do not acknowledge today. But if you do not yet understand that the "thee" of whom God thru Ezekiel is here speaking—is our democratic nations, as set forth and plainly PROVED in our free booklet "United States and British Commonwealth in Prophecy," then just remember that we are GUILTY of the very things that the people it does refer to are guilty of—and GOD IS NO RESPECTER OF PERSONS; so these things ARE GOING TO HAPPEN TO US. UNLESS WE HEED AND REPENT! The details of the Great Drought soon coming upon us are described in the first chapter of Joel. It's a frightful, desolate picture of starvation and disease! But all these things, as Jesus explained, are to be only the BEGINNING of our time of national trouble. Once we are weakened by starvation, disease, and the resulting calamitous economic depression, the Ten-Nation European Colossus will suddenly STRIKE with hydrogen bombs that shall DESTROY OUR CITIES and our centers of industrial and military production! The very next words of Jesus' prophecy (Matt. 24:9, 21-22) are: "Then"—not five years or a generation later, but "THEN" shall they deliver you up to be afflicted, and shall kill you: and ye shall be hated of all nations; ... and then shall be GREAT TRIBULATION such as was not since the beginning of the world to this time, no, nor ever shall be. And except those days [of mass death and destruction] should be shortened, there should no flesh be saved alive, but for the elect's sake those days shall be shortened." Yes, by the supernatural intervention of GOD, before all human life is blasted from off the earth! Jesus was there speaking of our peoples nationally, as well as of real Spirit-begotten Christians individually. But Ezekiel's prophecy adds this specific and terrifying fact: "And a third part"—HALF our remaining population "shall fall by the sword round about thee; and I will scatter a third part into all the winds, and I will draw out a sword after them." "In all your dwelling places, the cities shall be laid waste." (Ezek. 6:6). A few German cities were virtually laid waste in World War II. But not until the production of the hydrogen bomb has it ever been possible for an enemy to totally destroy all our cities! Yes, WAKE UP! America and Britain! You have grown calloused and indifferent to world revolution, world wars and cold wars and the threat of hydrogen-bomb war. You Americans and British! You smug, proud, stiff-necked complacent people! You enjoy a prosperity God never lavished on any other people—you heedlessly permit yourselves to became soft and decadent, setting your foolish hearts on a lush, push-button, prosperity of leisure. You ignore that entire prophetic THIRD of GOD'S WORD, warning you of impending disaster and offering you divine protection from it! Will any one of you who now read this warning awaken to the stern reality? GOD ALMIGHTY now reveals, in time to prevent it, that one third of all our people will soon die of starvation and disease—that our day of reckoning is upon us!—that we are to be stripped of our wealth and prosperity on which we set our hearts—that a second third of our people—of your personal friends, relatives, acquaintances—will be killed by the awesome hydrogen-bomb invasion—that our proud United States and British Commonwealth are now destined to be suddenly crushed in defeat!—that the remaining third left alive are to be carried as captives, scattered over the land of our enemies and their allies AS ABJECT SLAVES!—and that even millions of them shall then be tortured inhumanly in organized religious persecution, until their breath expires in martyrdom! Jesus Christ said, "Ye shall be HATED of ALL NATIONS ... Then shall they deliver you up to be afflicted, and shall KILL YOU." Do you foolishly and carelessly assume He meant somebody else? Our booklet "U.S. and Britain in PROPHECY" proves He meant US. We are the nations that are HATED by all other nations today—or hadn't you realized that alarming fact? Jesus Christ meant US—and His words are as certain and sure as the rising and setting of the sun! Luke's inspired account of Jesus' words makes it even more specific: "For these be the days of vengeance, that all things which are written may be fulfilled"—that is, when the prophetic things of your Bible come to their CLIMAX, and all prophecies are suddenly and rapidly fulfilled at this END-TIME! "And they"—speaking of our nations, "shall fall by the edge of the sword, and shall be led away captive into all nations." (Luke 21:22, 24). This prophecy refers only typically to the Jewish captivity of 70 A.D. It refers primarily to OUR future. Jeremiah was inspired by the Almighty to picture this invasion, defeat and captivity and to explain WHY it's coming! During the coming famines and disease epidemics, and during the Great Tribulation, with its fiendish tortures, people will die so rapidly that mass burials will take place. Here you see thousands of bodies being buried in a ravine by earth-moving equipment. and war of all history (verses 3-4), the time of OUR NATIONAL TROUBLE (verse 5). But WHY? Are we not Christian countries? So we vainly assure ourselves—but the prophecies of Jesus and of Paul reveal that we are DECEIVED into a counterfeit "Christianity"—our lands filled with MANY false ministers, coming IN THE NAME OF CHRIST, calling their religion "Christian." Jesus warned that when we worship Him by following traditions inherited from the pagans (such as Christmas, Easter, "faith without works," etc.) that we worship Him IN VAIN! Jeremiah gives the REASON: "I have wounded thee," says God, "with the wound of an enemy, ... for the multitude of thine iniquity: BECAUSE THY SINS WERE INCREASED." And, "I will correct thee in measure" (by this famine, disease, war, captivity and slavery) "and will not leave thee altogether unpunished." WHY? Because God revealed to Adam that He had set LAWS IN motion that produce happiness, joy, health and prosperity IF we obey them; but which bring on us curses and separation from God and His blessings, if we transgress. God made man a free moral agent, and commanded him to CHOOSE. Adam chose a WAY of living opposite to the way of God's inexorable LAWS. God sent Jesus Christ to reveal THE WAY of God, and to set us a living example in that way. But men crucified Him, then later appropriated His NAME, began proclaiming His deity, exalting His PERSON, while they DECEIVED the world and kept it in darkness estranged from God by rejecting His Gospel, and instead, adopting the pagan philosophies, beliefs, customs and ways that have characterized this (Satan's) world from the beginning. Listeners behind the Iron Curtain watch fearfully for intruders during "World Tomorrow" broadcast, while millions in Britain and America scoff at God's last-minute warning. Because of our sins, a famine of hearing the Word of God is soon to come! Today what is called organized "Christianity" appropriates the NAME of Christ—exalts His PERSON—worships Him—but continues to DENY HIS MESSAGE, and to rebel against God's laws! Can't you see what this has brought upon humanity? Sickness and disease; fear and worry; inequality and injustice; war and fear of war; heartache, anguish, emptiness! It's all the result of the ways of vanity, pride, selfishness, greed! Man's horizons have shrivelled and shrunken and become centered on his SELF. Life becomes a bore, so he invents pleasures, amusements to pass the time away! He organizes for wars of conquest. He invents engines of destruction that soon would blast all life from off this planet, if God would not prevent it. Would God show LOVE to this world by permitting this tragic state of affairs to continue? God allotted 6,000 years for HUMAN NATURE, automatically hostile to God and God's laws, to write the lesson of the vain, self-centered, getting way of life—the WAY that appears so alluring and attractive to fallible human minds! But God does LOVE this suffering world! God informed Adam—He sent His prophets to reveal HIS ways—He sent His Son—He has been sending His true ministers. God has pleaded with humanity for nearly 6,000 long years—with WORDS! But man persists in rejecting preachings and warnings. And now, at last, man has arrived at a period where he is learning the secrets of the forces of the universe! Thru science, technology and machine-industry, man is now harnessing the very forces and energies of nature! But he puts atomic energy to the work of mass DESTRUCTION. He now works feverishly, fanatically, concentrating the world's most scientific minds on developing hydrogen bombs, guided missiles, cobalt bombs, and other means of mass destruction. AT LAST man approaches not only a luxury, push-button, LEISURE age-but also the age of push-button mass DESTRUCTION. World renowned scientists who know, warn us that it is now possible to annihilate human life from off this planet! Can a God who LOVES THIS WORLD stand idly by, and permit man not only to destroy his health and happiness, but now also to destroy all earthly LIFE? GOD FORBID! God is a God of LOVE, and also a God of wisdom and justice, who says He punishes every son He LOVES! (Hebrews 12:6). The PUNISHMENT is to teach us the lessons of life. Man has written the lesson thru 6,000 unhappy years of emptiness, sickness, suffering and DEATH—written it in human blood and anguish! But he has never yet learned the lesson. Man still clings desperately to the notion that somehow he can yet solve all his problems and reach out and TAKE happiness HIS OWN WAY! Man refuses to learn the truth! He will not listen to God's preaching! He would persist to the bitter end to the annihilation of all human life, if God did not step in and intervene! There is only ONE LANGUAGE that rebellious mankind will heed—physical punishment, and being deprived of physical assets. Very few individuals ever came to God thru Jesus Christ in unconditional surrender until God had punished them by physical adversity. Neither will OUR NATIONS—and neither will the world as a whole come to God in any other way. And so now God is about to punish! First, He will punish our nations—professing Christians—His own chosen people, chosen for a service they have refused to perform! Then, after WE have learned our lesson and turned to our God, He will punish the nations He shall have used in punishing us. God says, "The Eternal hath a controversy with the nations, He will PLEAD with all flesh;"—HOW?—"He will give them that are wicked to the sword ... evil shall go forth from nation to nation, and a great whirlwind (of war) shall be raised up from the coasts of the earth. And the slain of the Eternal shall be at that day from one end of the earth even unto the other end of the earth." (Jer. 25:31-33). Yes, paradoxical though it may seem, THIS TERRIFYING NEWS ACTUALLY IS GOOD NEWS!—for this impending punishment is the only way a mankind of free choice can ever be brought to LEARN the lesson—to acknowledge that GOD'S LAWS were set in motion for OUR GOOD—to be brought voluntarily to CHOOSE the ways of God which at last will bring undreamed of UTOPIA! Yes, THE KINGDOM OF GOD is now NEAR AT HAND! And that is the best news since the first man drew the first breath! There is one reason, and one only, for the never-equalled national calamity that is destined soon to strike America and Britain. In NO OTHER WAY will mankind ever really LEARN the lesson he has so tragically written in human blood and suffering. God has decreed that we, ourselves, must choose whether to accept HIS divine rule over us with His inexorable laws, or whether to reject God's WAY, and follow the ways and customs that human nature devised and established in this Satan-swayed world. And God will not FORCE humanity to walk His way. Man MUST first LEARN his lesson, and then make his own right choice! But again, I repeat—IT'S LATER THAN YOU THINK! Yes, time is running out on us, fast, and we're too sound asleep in deception to realize it! Our peoples will continue only a few more years in comparative economic prosperity. This very prosperity is our fatal curse!—because our people are setting their hearts on it, seeking ease and leisure, becoming soft and decadent and WEAK! We're GOING THE WAY OF ANCIENT ROME—to a greater fall, because we're bigger and more prosperous, and have farther to fall! Then, suddenly, before we realize it, we'll find ourselves in the throes of FAMINE, and uncontrollable epidemics of DISEASE. Already we're in the beginning of a terrible famine and we don't know it—a famine of needed minerals and vitamins in our foods. Our peoples have ignored God's agricultural laws. Not all the land has been permitted to rest every seventh year. The land has been overworked. Today, the soil is worn out. And food factories, in the interest of larger profits, are removing much of what minerals and vitamins remain—while a new profit making vitamin industry deludes the people into believing they can obtain these precious elements from pills and capsules purchased in drug stores and "health food" stores! And all this state of affairs because man is in defiance of his Maker! Along with the coming famine and disease epidemic will come an invasion of billions of crop-destroying bugs, insects, and locusts (grasshoppers) on a scale never before to devastate a land. You'll read of this in the first chapter of Joel. Anxious laborers after World War II line the streets of London, displaying placards against unemployment. One sign reads, "We don't want the dole, we want work." This is going to happen again on a nation-wide scale amid starvation and raging epidemics. All this is now only a few years off. WHEN we are stricken with the greatest national tragedy ever to befall a nation—people dying in nearly every home—your loved ones—perhaps your children, or your parents, and scores of your close friends—perhaps even YOURSELF dying in this calamity, and the nation's economic prosperity suddenly tail-spinning into its lowest ebb of depression, then the Nazi-Fascist colossus will strike its hydrogen-bomb blows—and another third of our populations will be killed—our major cities and industrial centers destroyed. Only one in three of your friends—of your loved ones—will remain alive—UNLESS they heed the warning and come under God's divine protection according to HIS conditions! And remember! Every individual will then stand on his own feet before God. YOU cannot secure the protection of your loved ones. Nor can the prayers, the godliness or righteousness of any friend or loved one save you. Each individual must come to real repentance, total and unconditional surrender to GOD'S will, and His Word and its authority, through Christ as personal Saviour, in order to have the proffered divine protection from these impending catastrophes. See Ezek. 14:12-14; and Jer. 31:29-30. I know this is not pleasant to contemplate! I know well, too, that it won't be believed by more than a few. I know only too well that our proud and stiffnecked nations will heedlessly refuse to take WARNING! But also I know that these prophecies are as certain as tomorrow's sun—unless our nations do heed God's warnings, repent and turn from their established ways and customs and return to ALMIGHTY GOD and HIS LAWS and WAYS! And, knowing that such an unbelievable catastrophe is soon to strike, I HAVE TO WARN YOU!! You can read what God says to me in Ezekiel 33:1-6. THINK OF IT! Unbelievable? Preposterous? No, IT'S REAL—very soon,—of this very present generation—of all people you know now—ONLY ONE THIRD of them will be left alive! And that surviving third will be uprooted from their homes—transported like cattle as slaves to Europe, and probably some to South America (the Germans are fast gaining dominance and control in South America). There they shall not only be forced under lashes of cruel taskmasters to do the work of slaves—but they will be forced to give up whatever belief they may have in real BIBLE Christianity! They will be literally forced to accept the idolatrous PAGAN beliefs and customs that masquerade as Christianity, or state police will arrest them, and they will be TORTURED inhumanly until they either give in, or die in martyrdom! Yes, millions of lukewarm inactive professing Christians will suffer MARTYRDOM—and that before the anticipated push-button leisure-year of 1975 dawns upon us! You'll read of this martyrdom—the Great Tribulation—in Mat. 24:9-10, 21-22; Rev. 17:6; 6:9-11; 12:11, and in many other verses. A rally of unemployed at Madison Square Park in New York. The sign above speaker's stand proclaims "Jobs for all—at decent pay." This typical scene will soon become wide spread throughout western world. Economic ruin is coming! The first beginnings of the new German Luftwaffe. German pilots and their American flight instructors head for their planes at Landsberg, southern Germany. West German soldiers march to firing range carrying various American-made weapons and wearing American uniforms. Berlin, today! Prosperous shoppers line Berlin's busy streets as traffic policeman (upper right) in newly constructed, modern glass and concrete tower controls traffic at the busy intersection of Kufurstendamm and Joachimstaler Strasse. This new Germany is to be totally annihilated by Russia after it first conquers America and Britain! When God intervenes in world affairs, catastrophic earth tremors will create imagination-defying waves, sweeping whole cities from their foundations, killing millions of terrified unrepentant victims in their surging power of destruction. Mankind will learn its lesson in no other way! This coming Great Tribulation is not the Wrath of God upon the world's wicked—it is the wrath of Satan the devil upon Christians, and upon the democratic nations (Rev. 12:12-13). Millions of repenting SAINTS will be IN it, and the very objects of it—because it is for their sake that God will intervene to CUT SHORT that hellish time of torture (Matt. 24:22). This, I well know, is not the popular orthodox teaching of a "Christianity" that is a part of THIS WORLD and has LOST the PURPOSE and the PLAN of God. But this is GOD'S TRUTH, straight and direct to YOU! This fanatical, unheard-of, Satan-inspired fiendish Tribulation and martyrdom will continue three and a half years. But then it shall be suddenly CUT SHORT—by the divine, supernatural INTERVENTION OF GOD! If God did not act swiftly to cut short this diabolical inhumanity of man to man, under the satanic sway, no human flesh would be saved alive! (Matt. 24:22). If there were not some of God's ELECT—(those who can't be deceived (verse 24)—those who cry out to God (Luke 18:7)—in this frightful tribulation, God would not intervene to save humanity. But for the sake of those "elect" awaiting martyrdom, who had not been accounted worthy to escape this awful time, but who now, at last, do cry out to God for mercy and deliverance, those days shall be supernaturally cut short! During this hellish 3 1/2 years, there will be no religious freedom. The entire western world will be under the resurrected Roman Empire—Church and State united—the religion and all schools under a Religious Hierarchy, enforced by the civil police. The entire eastern world will be under atheistic Communism. Neither the eastern or the western world will permit any true Gospel preaching whatsoever. This is the time, following the famine of food, when there shall be a spiritual famine—a famine of hearing the true WORD OF GOD (Amos 8:11). Millions who now HEAR the true Gospel on The WORLD TOMORROW program worldwide, but who treat it lightly or spurn it, will wish THEN that they had heeded! But at that juncture the God who rules the universe will suddenly step in, and supernaturally intervene. He will do this in two stages: first, by terrifying warning SIGNS; finally, by actual PLAGUES in physical punishment. Yet, even then, God will first give warning! Once again, an all-merciful and LOVING God will give humans opportunity to REPENT—to turn from this world's ways that have cursed mankind, and to receive divine PROTECTION from God-sent plagues. Suddenly something terrifying in appearance will happen in the sky. Just how God will bring this about is not revealed. But, to human eyes, the SUN suddenly will go dark; there will be no light from the moon: the only light will come in the form of millions of stars-meteors—falling to the earth in such frightful display that men will faint or run screaming in stark terror. Astronomers will be baffled. Science will be unable to explain these happenings. But this is only the beginning. Far more frightening, men will look up and suddenly see the SIGN of Christ's imminent personal return in the heavens (Matt. 24:29-30). This is explained (Rev. 6:12-16) as the heavens departing as a scroll being rolled together, and the awe-inspiring bright-as-the-sun face of God the Father, and also that of Christ at His right hand, becoming visible. Men will be thrown into frantic terror—for no man can look upon God and live! Frightened out of their wits, men shall try to hide in buildings, in caves in the mountains—they shall cry out in consternation for the rocks of mountains to fall on them, to hide them from the sun bright countenance of the Creator! In terrified panic, a God-ignoring, God-rejecting, pleasure-seeking mankind suddenly will become very much aware that GOD IS REAL—aware of His mighty POWER and CLOSENESS! At that mighty moment of earth's history, hundreds of thousands will remember the TRUE MESSAGE FROM GOD that they had heard going out freely to the world at THIS time, on The WORLD TOMORROW program. Yes, hundreds of thousands who take it lightly today, or put it out of mind because it's different from the teachings of their worldly churches, will then REMEMBER and cry out to God for mercy! And these hundreds of thousands shall learn that God's mercy, truly, is greater toward us than the heavens are high above the earth! For God will hear their repentant cries, and place them under His divine protection from the indescribably terrible PLAGUES which are then yet to come! For these are the plagues that GOD shall send—plagues sent in divine PUNISHMENT on those Fascist powers of Europe that shall have yielded themselves as the chief political religious agencies of SATAN in his defiant war against God! At this precise juncture—again for the ELECT'S sake—God will hold back the punishing winds of war and of plagues (Rev. 7:1-3). The actual physical punishment of this great and mighty DAY OF THE LORD will not fall until God has sealed, with His protection, those who have now suffered through the Great Tribulation (Rev. 7:14), and have now at last learned their lesson, and turned repentantly to GOD. Among these, now yielding their lives to God and to HIS WAYS, will be the much-quoted but little-understood "144,000." There will be 12,000 from America—another 12,000 from British Commonwealth nations—12,000 Jews—12,000 from each of the 12 tribes of Israel except Dan—Joseph is given a DOUBLE-portion. But also, with them, there shall be an INNUMERABLE MULTITUDE out oœ all nations, who shall in total surrender cry out to God. The 144,000 Israelites will then have the name of God the Father (Rev. 14:1) sealed in their foreheads (Rev 7:3-4)—that is, in their minds. These all shall receive God's Holy Spirit—be then begotten as children of God. And who shall then, at last—having endured the Great Tribulation—having seen God's terrifying warning SIGNS—repent and put their lives in God's hands, shall come under God's divine protection. NO PLAGUE will touch them (Psalm 91:1-11). But all others, still the vast majority, will not repent. And all who will not repent at this time, after this final SUPERNATURAL WARNING, will have so hardened their hearts in resentfulness and bitterness against God that they will not repent, even during the plagues that shall then immediately follow (Rev. 9:20; 16:9,11). Now after these mighty events will come the time of GOD'S WRATH against sinful men who have refused to depart from the ways that are damning their own souls. Now God, at last, after every possible warning and pleading short of physical punishment, will let the divine punishment fall! Now comes, in full divine FURY, the period foretold in more than 30 prophecies as "The DAY OF THE LORD"—the time of God's Wrath! "Vengeance is Mine," says the Almighty God. Now He shall pour out the vials of His vengeance on those who have voluntarily chosen Satan. Plagues, terrible beyond description, shall fall upon this Fascist European Empire. God will now take vengeance for their fiendish tortures of His peoples during the Great Tribulation. The sixth of these punishing plagues will be a military invasion of Europe by the Communist forces from Russia and the Orient. By that time, the Red Armies of Russia, China and allies will number TWO HUNDRED MILLION! Think of it. A vast army of two hundred million soldiers! These vast hordes will then sweep across Europe, UTTERLY DESTROYING ALL THIS RESURRECTED ROMAN EMPIRE! It is spoken of prophetically as the modern "BABYLON"—the daughter of the ancient Babylon of Nebuchadnezzar. It is a "BABYLON" led by the symbolic harlot "woman"—the great apostate paganized Church falsely calling herself "Christian." Unrepentant human beings will be stricken with excruciatingly painful boils—no position of the body may give relief from their agonies—as God destroys the evil works of sinning mankind to bring the nations to repentance and peace. Just as Nebuchadnezzar's ancient Babylon was totally destroyed—not an inhabitant left—so shall this successor and her European territory be TOTALLY devastated, left without an inhabitant! Meanwhile, the FUEHRER, or whatever the Leader shall be called (prophecy symbolizes him under the name "THE BEAST"), together with the "False Prophet"—religious Leader associated with the military Leader—will have moved their capital to the environs of JERUSALEM, which they will have captured at the outset of World War III—the beginning of the Tribulation. They will, by the time of the Russian invasion, have large military forces in Palestine, as well as on other fronts of the world war. Communists, incidentally, shall not take over Palestine, nor other southwestern Asiatic territory. Just now they are bidding strongly for it. But it will fall, instead, into the hands of the resurrected Roman forces. Finally ... The WORLD TOMORROW! Now we come to the CLIMAX of all the ages! At this precise juncture, the Supreme RULER of the Universe—Jesus Christ, glorified, to whom has been given ALL POWER in heaven and in earth, who upholds the energies and forces of the entire universe by the Word of His Power—yes, the SAME Jesus Christ who trod this unhappy earth more than 1900 years ago—will return in clouds to earth, visibly, personally, bodily! This time He is coming in all His Power and Glory, to PUT DOWN all opposition, to RULE all the nations of earth with supernatural force. He is coming not only as KING of kings, but also as LORD of lords. This time He is coming to RESTORE the laws and the rule of GOD! He is coming to enforce those spiritual, inexorable LAWS—the very laws set in motion to bring humanity PEACE, HAPPINESS, JOY, HEALTH, PROSPERITY! But those who shall have refused to repent and turn to God at the end of the Great Tribulation and during the ensuing Day of the Lord still will refuse to submit. As the glorified omnipotent Christ is descending toward earth in a cloud—with all the holy angels of heaven escorting Him, the dead IN Christ—all who truly had repented, been begotten by the Holy Spirit, and who had overcome their own natures thru God's power, who had grown in spiritual grace, knowledge and character, and had endured persecution and opposition to the end—shall be resurrected from their graves, immortal, divine, now BORN of God at last. The living IN CHRIST shall at the same instant be changed from mortal to immortal—from material flesh to spiritual—from human to divine. And they shall be caught up, with the resurrected saints, to MEET the descending, glorified Christ in the air. Many have wondered WHY this meeting up in the air. These born-again saints will rise from all parts of a round earth. They shall be taken through the air at the speed of lightning. (Matt. 24:27). They shall all descend together to the Mount of Olives, one-half mile east of Jerusalem, from which Jesus ascended over 1900 years ago! Simultaneously, at the very Presence, or coming, of Christ and all the holy angels, the seven last plagues of God's Terrible Day of WRATH shall be poured out on the remnants of this Fascist Europe. They will be covered with BOILS from head to foot. The sea, the lakes, and the rivers will become as human blood—all drinking-water will be polluted. This "Beast" power shall have shed the blood of innocent Christian martyrs—now God will give them blood to drink! Next, the sun's rays will become so intense men will be literally scorched with the heat. But these God-defying embittered sons of Satan will only scream out agonizing curses, blaspheming the very name of the God who is punishing them to save them from themselves. They will still refuse to repent. Next, Christ will pour out the fifth plague on the very seat of this "Fuehrer" and the "False Prophet" at Jerusalem—the light of the sun shall now be withdrawn, and in the resulting darkness they will gnaw their tongues in pain—but they will not yet surrender to God. Instead, they will scream out curses damning the name of Christ. It is at this very stage in these plagues that the demons, possessing these rebel leaders (Rev. 16:13-14), will mobilize military forces in the Valley of Megiddo, 70 miles northeast of Jerusalem, to FIGHT against the returned Christ and His angels. They will yet try to overthrow the divine power, and rule the world themselves. They will resist to the END! But these human leaders shall be fighting SUPERNATURAL Power! Their fate will be AWFUL! Their flesh will consume away off their bones even while they yet stand on their feet! Then the last of these plagues of divine judgment shall fall. There will be a bedlam of thunder accompanying unprecedented, frightening flashes of lightning. The most tremendous earthquake of all history will rock the earth. Then will fall out of heaven a devastating hailstorm, with huge hailstones weighing as much as a hundred pounds! But again these hardened men will blaspheme God because of this plague! They still will refuse to LEARN their LESSON, and find the way to peace and happiness for all! As the Battle of this Great DAY OF THE LORD comes to its fateful end, with the armies assembled at ARMAGEDDON destroyed, and as the final plague of the seven last Plagues is poured out, the military "Fuehrer" and the "False Prophet" (who during these closing days shall have deceive the world by faked miracles) will be taken together, and cast alive into a "lake of fire burning with brimstone." And now, his military and religious legions destroyed, his devil-controlled human leaders dead, Satan himself shall be cast into the abyss or symbolic bottomless pit—a condition of total restraint, inactivity and negation—so that he cannot influence, sway or deceive humanity any further for a duration of 1,000 years. Those overcoming saints of Christ, now BORN of God—now GLORIFIED, even as Christ has been glorified—form and constitute, under Christ, the KINGDOM OF GOD. It shall be at once the divine spirit-born FAMILY of God, and the GOVERNMENT of God, which shall bear rule over all the earth! And now what of the remainder of mankind? With Satan removed, their political and religious leaders dead, their armies totally destroyed—no one to lead them any further into HUMAN ways against God's rule, all who remain alive after these catastrophic wars and plagues will be forced, at last, to submit to the rule of Christ and the Kingdom of God. Only ONE religion will then be allowed—that of the TRUTH of the Creator GOD. Those who have been converted down thru the ages, now made immortal in the Kingdom of God, will rule over and TEACH those humans who remain alive. A fraction of today's population will still survive. Still human and mortal they will continue to live and reproduce, even as they now do. But they will be ruled over by the immortal saints, under Christ, with the RULE OF GOD. For example, they will be required to observe God's annual holy days instead of the present world's pagan holidays, such as Christmas, New Year's, Easter, etc. The people of all nations will be required to come up to Jerusalem, then the world capital, to keep the Feast of Tabernacles in the fall of the year. If they refuse, there will be no rain on their land thereafter. If they still refuse, Christ will send supernatural plagues to punish them into submission. (Zech. 14:16-19). Gradually, a stubborn, stiff-necked, hostile and rebellious mankind will be forced into the WAYS and the LAWS of God. Soon they will begin to see that they have HEALTH instead of sickness; interesting, abundant, HAPPY lives, instead of emptiness, boredom and unhappiness; alert, comprehending minds instead of dullness, inefficiency, stupidity; prosperity, instead of poverty; JOY, instead of depression, fear and worry, heartache and frustration. They will look back over the 6,000 year period of HUMAN EXPERIENCE during which God allowed mankind to decide the WRONG way, and set up a man-built civilization contrary to the laws of God. They will compare. A world filled with peace, safety and happiness is coming! Here you see what The World Tomorrow will be like when "the wolf shall dwell with the lamb, and the calf and the young lion together, and a little child shall lead them." This wonderful world is pictured in Isaiah 11. DO YOU THINK ANYBODY WILL THEN WANT TO GO BACK TO THE WAYS OF OUR WORLD TODAY? No! In those days (Micah 4:1-3), the KINGDOM OF GOD shall be established above all nations. The people finally will say: "Come, and let us go up to the KINGDOM OF GOD; and Christ will teach us of HIS ways, and we will walk in his paths." For GOD'S LAW, which even most preachers and churches HATE today, shall then go forth from God's glorious kingdom, and the WORD OF GOD from Jerusalem. The earth will at last be FULL of the knowledge of GOD—the TRUTH! (Isa. 11:9). And Christ shall rule over and judge all nations, UNTIL they beat their swords into plowshares, their weapons of destruction into implements of peaceful PRODUCTION. WE SHALL HAVE WORLD PEACE! There are REASONS for today's ills! What we sow, we reap! It will be a Utopia beyond man's fondest or wildest dreams! God Almighty created and set in MOTION the laws to produce just such a Utopia. When humanity yields to that divine rule, we shall have it! Your immediate future is of your own choosing. You can take this lightly, let it slip from mind, allow yourself once again to be absorbed in the mechanics of today's complex society that you put this out of mind. If you do, you have now read YOUR FATE—and I say to you on authority of God Almighty that it is absolutely SURE! 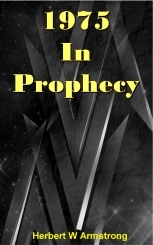 Or, you may heed the warning, realize the truth—that there already have occurred in the world sufficient happenings to verify the REALITY of God's prophecies—and REPENT NOW before it is too late. If you DO turn to God by forsaking your way and this world's ways through Jesus Christ as personal Saviour—if you DO then overcome, study the Bible continually to let it correct and reprove and instruct YOU—living by EVERY WORD OF GOD, rather than by the ways and customs of society—if you pray earnestly and continually, drawing closer and closer to GOD, and endure in this wonderful new life, you shall be accounted worthy to ESCAPE all these terrifying things soon to befall the world. (Luke 21:36). You may escape the Great Tribulation. No PLAGUE will come near you. And, finally, given the precious gift of eternal life, you shall be used in God's Kingdom teaching and ruling those human beings made joyous in that PEACEFUL WORLD TOMORROW! The decision is now YOURS! This booklet is exceedingly brief and condensed. The reader is advised to read it a second time. This disclosure is so amazing, so different from the common conception, you probably did not really grasp it all the first reading. Much in the early pages will take on a different light when re-read, in the light of what you have read in later pages. Take time to stop and thoroughly read and study every Scriptural passage quoted. It will become twice as interesting, twice as REAL! To fully understand the significance of these prophecies, you need to know where the United States and Britain are mentioned in prophecy. This question is answered in our booklet "United States and British Commonwealth in Prophecy." A copy of this booklet may be obtained free, by clicking above link.